Caution got the better of the central bank yesterday when it upset market forecasts by choosing to only "slightly" flatten the path of the Singdollar's appreciation. There had been expectations that there would be a more aggressive currency weakening, given the global risk aversion that has driven the dollar to trade nearer the floor of the policy band since July. So when the Monetary Authority of Singapore (MAS) announced at 8am its "measured adjustment" to "slightly" slow the pace of the Singdollar's gains without departing from its policy of "modest and gradual appreciation", the Singdollar shot up on a knee-jerk reaction. Traders scrambled to unwind their short bets against the currency as the milder-than-expected easing limits how far the Singdollar can fall in the near term. One reason why the MAS may have avoided a large or abrupt currency depreciation and unleashed a "half surprise" instead is that the economy, while sluggish, has not yet entered the danger zone, said Mizuho economist Vishnu Varathan. "To be sure, (early data out yesterday showed that) Singapore had averted a technical recession by the skin of its teeth," he said, but neither is Singapore facing "a large, adverse, negative shock such as the Lehman collapse in 2008". The last time MAS changed course to zero appreciation was in October 2008. Yesterday was the second time it flattened the slope of the Singdollar appreciation this year. On Jan 28, it surprised by easing exchange rate policy outside of its scheduled biannual meetings in April and October, after downgrading its inflation forecast. The difference is that yesterday's slope change - which the MAS billed as "slight" - marks a turn towards a "cautious", "extremely calibrated" and "incremental" approach to support growth, said economists. 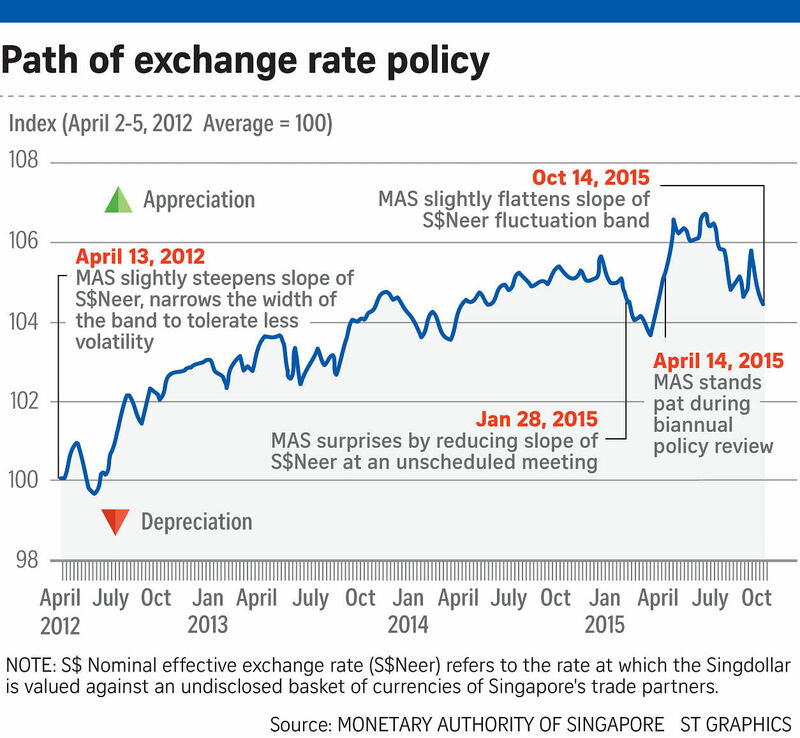 For this reason, many expect further exchange rate easing at the April review. "This is the smallest slope change that MAS has done, and can be considered only a token easing," said ANZ forex strategist Khoon Goh. "We see the chance of further policy easing, with the next step most likely being a shift to a neutral slope, given MAS' desire for incremental moves." Disappointing growth rather than inflation seemed to drive the central bank's move yesterday. "The overall outlook for the global economy has softened compared to the review in April," said MAS in a statement, adding that its move was "supportive of economic growth into 2016". But the MAS also lowered its headline inflation outlook to come in at around -0.5 per cent this year - the lower end of its previous forecast range. Notably, the MAS changed its assessment of the labour market in this review, stating that "wage cost pressures remain", though their pass-through to consumer prices would be constrained by the "subdued growth environment". "The tight labour market language was conspicuously absent," said Citi economist Kit Wei Zheng.